CONTRAVE® is a prescription medicine which may help some adults with a body mass index (BMI) of 30 kg/m2 or greater (obese), or adults with a BMI of 27 kg/m2 or greater (overweight) with at least one weight-related medical problem such as high blood pressure, high cholesterol, or type 2 diabetes, lose weight and keep the weight off. CONTRAVE® should be used with a reduced calorie diet and increased physical activity. It is not known if CONTRAVE® changes your risk of heart problems or stroke or of death due to heart problems or stroke. It is not known if CONTRAVE® is safe and effective when taken with other prescription, over-the-counter, or herbal weight loss products. It is not known if CONTRAVE® is safe and effective in children under 18 years of age. 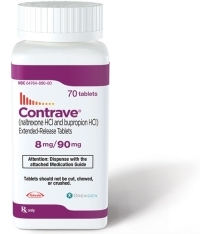 CONTRAVE® is not approved to treat depression or other mental illnesses, or to help people quit smoking. *What Are the Benefits of CONTRAVE®? The use of CONTRAVE® in combination with diet and exercise has helped patients in clinical studies to lose weight. In one clinical study, participants took CONTRAVE® in conjunction with reducing their calorie intake, increasing their physical activity and participating in lifestyle counseling. On average, people lost 5.4% of their excess body weight and 42% of the participants lost 5% or more of their excess body weight. Wondering If CONTRAVE® Is Right for You? The all-important first step in your weight loss journey is to schedule a consultation with Dr. Moore or Dr. Thomas to assess if you are an ideal candidate for CONTRAVE®.